How can cities located along the Pacific Plate mitigate the effects of climate change, rising sea levels, typhoons and seismic activity? Architecture firms Kohn Pedersen Fox Associates and Leslie E. Robertson Associates proposed a high-density Tokyo ecodistrict built on resilient infrastructure that can withstand waterborne risks while harnessing various types of renewable energy (including kinetic energy from trains). 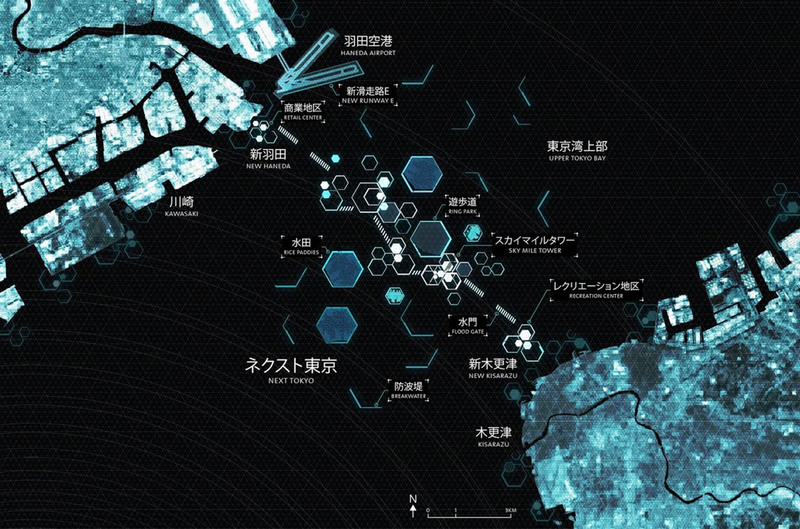 Their "Next Tokyo" proposal even envisions the use of Elon Musk's Hyperloop transport system. The proposal includes coastal defense infrastructure that acts as a buffer, as well as island housing clusters that can accommodate half a million people seeking to leave high-risk coastal areas and reduce commute times. 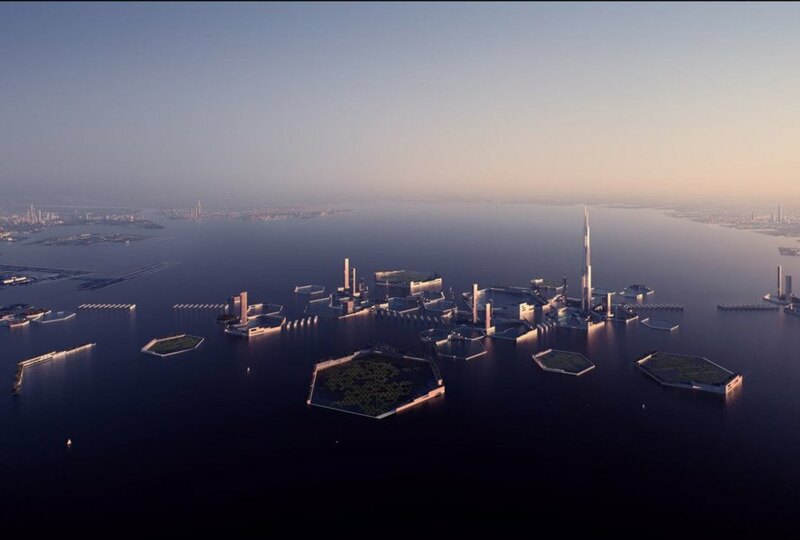 Hexagonal water-filled rings would allow sharing of resources such as freshwater reservoirs, public beach harbors and urban farming plots, while faceted breakwater bars and additional operable floodgates would provide additional defense. The scheme would serve as a transit hub, with tunnels, regional lines and even a new Hyperloop transport system liked that proposed by Elon Musk. 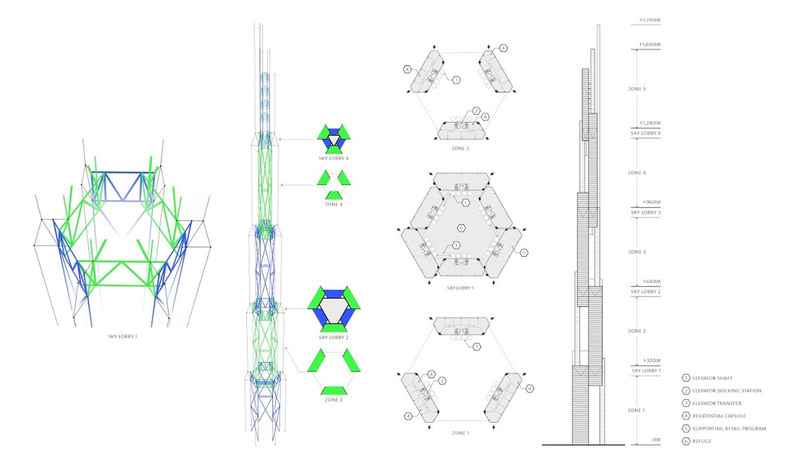 The primary station would service the Sky Mile Tower, a high-density residential structure reaching over 1,600 meters in height. This megatall building, conceived as a set of three interconnected structures, would feature multi-level sky lobbies, shared public spaces, shopping areas, restaurants, hotels, libraries, gyms and clinics. Its stepped and tapered form, with various openings that allow the wind to pass through, ensure the structure’s sound aerodynamic performance. ‘Next Tokyo’ is expected to generate energy on-site, capturing kinetic energy from trains running across the bay, solar power from photovoltaics and wind power that would be harnessed through microturbines integrated in the upper parts of the mile-high tower. The infrastructural rings would help grow algae as a clean fuel source. The proposal includes coastal defense infrastructure that acts as a buffer, as well as island housing clusters that can accommodate half a million people seeking to leave high-risk coastal areas and reduce commute times. Hexagonal water-filled rings would allow sharing of resources such as freshwater reservoirs, public beach harbors and urban farming plots, while faceted breakwater bars and additional operable floodgates would provide additional defense. The primary station would service the Sky Mile Tower, a high-density residential structure reaching over 1,600 meters in height. This megatall building, conceived as a set of three interconnected structures, would feature multi-level sky lobbies, shared public spaces, shopping areas, restaurants, hotels, libraries, gyms and clinics. Its stepped and tapered form, with various openings that allow the wind to pass through, ensure the aerodynamic performance of the entire structure. 'Next Tokyo' is expected to generate energy on-site, capturing kinetic energy from the trains running across the bay, solar power and wind power which would be harnessed through microturbines integrated in the upper parts of the mile-high tower. The infrastructural rings would help grow algae as a clean fuel source. The scheme would serve as a transit hub, with tunnels, regional lines and even a new Hyperloop transport system similar to that proposed by Elon Musk. Next Tokyo by Kohn Pedersen Fox Associates and Leslie E. Robertson Associates.